After a few late evenings getting the car ready, and the first event at Snetterton booked - maybe its an idea to be a bit prepared for what's coming? We tottered along to a local motor club meeting (the club that was organising the event) as it seemed to be the most common suggestion from people we had met in motorsport - but I always thought 'clubs' to be a bit weird. Whilst most of their advice was well meant, the club night turned out to be people who wanted to rally, but didnt for one reason or another, and seemed a little pointless. There was plenty of enthusiasm, but not a lot of experience. No doubt, not all motor clubs are the same, but I did start to understand why motor clubs in general are struggling for members! From Simon Galliford's recommendation, we gave Andy Bull a call who was very generous with his help and advice, popping over to our place for an evening to give Linette the lowdown of navigating and what to expect - which was worth its wait in gold at the time. On your first event, I guess everything is going to be a bit confusing, and it was. Scrutineering, noise test, signing-on, licenses, fire extinguishers blah, blah...on and then you need to do some driving, eventually! Like most single venues, particulary running towards the back, it can seem more like a race when you join the stage which other cars all around you - not what you first expect on a rally. Once the first stage was out of the way, you settle down, but I was'nt happy to say at the time that by mid-afternoon I was a bit bored! It felt like a bit of an anti-climax, particulary after testing on gravel with Vision Motorsport. All in all, the day went better than expected in the end. 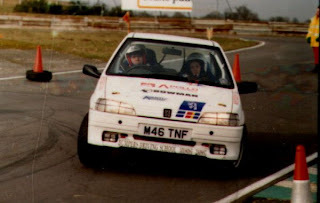 The car was fine, although on a full forest set up, no anti-roll bars and Colway 'rock-hards' we managed 2nd in a class of 12 and 31st overall - missing out on the class win by 10 seconds.